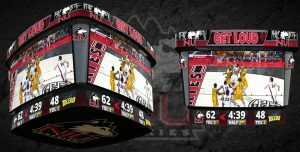 Daktronics announced the upcoming installation of a new LED video display system at Northern Illinois University’s (NIU) Convocation Center in Dekalb, Illinois. Installation is scheduled for this summer to have the system up and running for the fall sports seasons. The displays in the four-sided centerhung will each measure more than 8 feet high by 14.5 feet wide and will feature a tight 4-millimeter line spacing bringing greater resolution to crisp, clear images for fans throughout the venue. Upper and lower LED ring displays will provide space for game information, fan engagement elements, and sponsorships. In addition to the centerhung configuration, two new end wall video displays will be installed on the east and west ends of the Convocation Center. These displays will measure more than 9 feet high by 15.5 feet wide and will feature 10-millimeter line spacing to bring additional views to Huskies fans. The main centerhung and end wall video displays are capable of variable content zoning allowing each to show one large image or to be divided into multiple different zones. The displays can show any combination of live video, instant replays, game statistics and information, graphics and animations, and sponsorship messages. In addition to the LED displays, the Convocation Center will also receive new shot clocks and upgraded display panels on the Lincoln Highway marquee. Digital content provided by Daktronics Creative Services is also included with the installation to bring the displays to life.